David Budbill was one of Vermont's most beloved authors. During his prolific career, he wrote 10 books of poems, 7 plays, 2 novels, a collection of short stories, 2 picture books for children, and the libretto for an opera. Well known for such works as Judevine, several new works of David’s are being published posthumously, including his newest book of poems titled Tumbling Toward the End, and a novel titled Broken Wing. 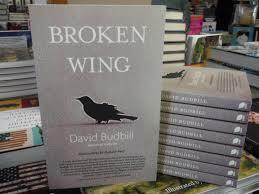 David worked on Broken Wing over the last 10 years, and is a story about a man who lives alone in the mountains of northern Vermont, and his relationship with his world around him, in particular, a Rusty Blackbird with a broken wing. Unable to fly, the bird becomes trapped in the challenging winter climate. It is a timeless piece, and is a story of a man living a solitary life, yet with emotional intensity. A story of loneliness, survival, and tenacity. Although David Died this past September, and will be sorely missed, we will continue to hear his voice, and to enjoy the treasures of his passionate efforts, forever. For more information on David, and his iconic career, you can go to his website.